Shelby Boatman, the new Executive Director of the Clinton County History Center, reported to the Rotary Club that the Center is happy to be partnering with the Honor Flight Reunion. Also, the Center is now open on Saturdays from 10-2. From left are Rotarian Kathryn Harrison Tiger, Shelby Boatman, and Wilmington Rotary President Dan Evers. 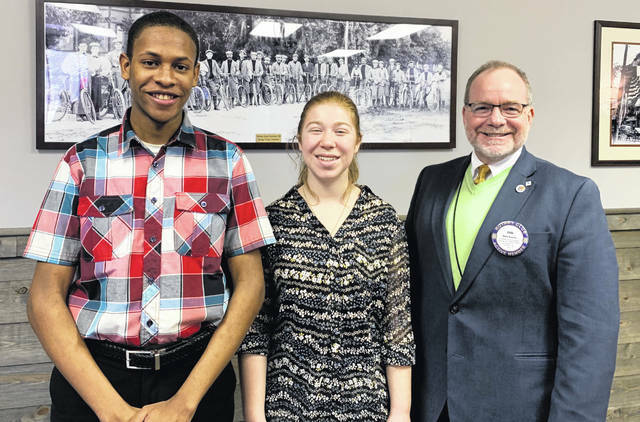 Shmar Human, left, from East Clinton High School was introduced to the Wilmington Rotary Club as the club’s Student of the Month. Human described his activities and his plans for the future. Emily Brausch, middle, a student at Clinton-Massie High School, is a participant in the Rotary club’s Four Way Test speech contest and she spoke to the club on her mission trip to Poland and how it reflected the Four Way Test, which is: Of the things we say and do … Is it the truth? Is it fair to all concerned? Will it build goodwill and better friendships? Will it be beneficial to all concerned? At right is Wilmington Rotary President Dan Evers. 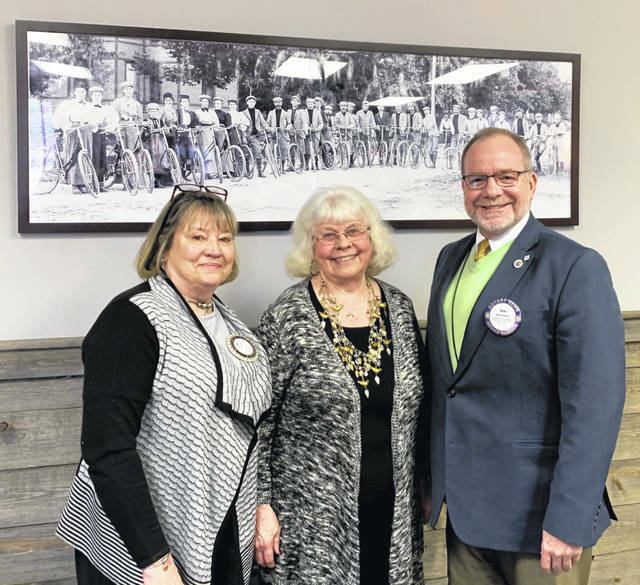 Jennifer Hollon spoke to the Wilmington Rotary Club which meets at noon at Damon’s Restaurant about the photos that adorn the meeting room at Damon’s Restaurant, where the Rotary Club meets. The photos came from Jennifer’s father’s (Dr. Richard Bath) closet. Cindy Camp, owner/manager of Damon’s Restaurant, wanted historical photos to decorate the meeting room and Hollon was able to help her out. After viewing hundreds of photos, Camp selected photos, which were copied, enlarged and framed and hung on the meeting room wall. Hollon then walked the club thorough the history and stories behind the photos. Hollon has been able to determine details about images and time frames and people in many of the photos. From left are Camp, Hollon and Wilmington Rotary President Dan Evers. https://www.wnewsj.com/wp-content/uploads/sites/22/2019/04/web1_IMG_0105.jpgShelby Boatman, the new Executive Director of the Clinton County History Center, reported to the Rotary Club that the Center is happy to be partnering with the Honor Flight Reunion. Also, the Center is now open on Saturdays from 10-2. From left are Rotarian Kathryn Harrison Tiger, Shelby Boatman, and Wilmington Rotary President Dan Evers. 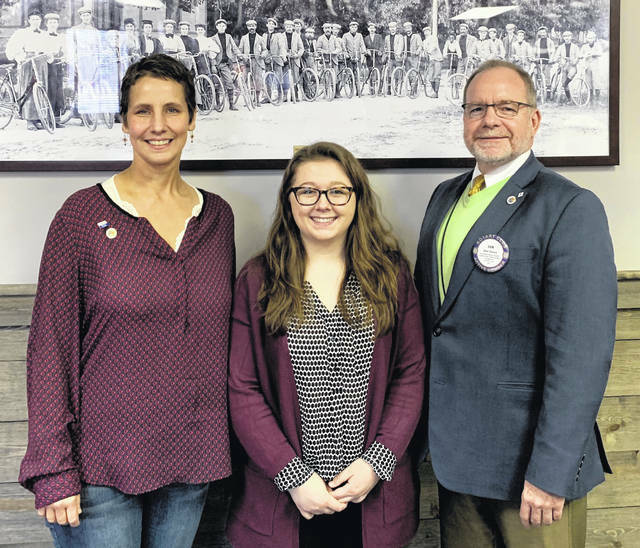 https://www.wnewsj.com/wp-content/uploads/sites/22/2019/04/web1_IMG_0102.jpgShmar Human, left, from East Clinton High School was introduced to the Wilmington Rotary Club as the club’s Student of the Month. Human described his activities and his plans for the future. Emily Brausch, middle, a student at Clinton-Massie High School, is a participant in the Rotary club’s Four Way Test speech contest and she spoke to the club on her mission trip to Poland and how it reflected the Four Way Test, which is: Of the things we say and do … Is it the truth? Is it fair to all concerned? Will it build goodwill and better friendships? Will it be beneficial to all concerned? At right is Wilmington Rotary President Dan Evers. https://www.wnewsj.com/wp-content/uploads/sites/22/2019/04/web1_IMG_0104.jpgJennifer Hollon spoke to the Wilmington Rotary Club which meets at noon at Damon’s Restaurant about the photos that adorn the meeting room at Damon’s Restaurant, where the Rotary Club meets. The photos came from Jennifer’s father’s (Dr. Richard Bath) closet. Cindy Camp, owner/manager of Damon’s Restaurant, wanted historical photos to decorate the meeting room and Hollon was able to help her out. After viewing hundreds of photos, Camp selected photos, which were copied, enlarged and framed and hung on the meeting room wall. Hollon then walked the club thorough the history and stories behind the photos. Hollon has been able to determine details about images and time frames and people in many of the photos. From left are Camp, Hollon and Wilmington Rotary President Dan Evers.